Omega-3 fatty acids are considered essential fatty acids. They are necessary for human health but the body can’t make them, you have to get them through food. 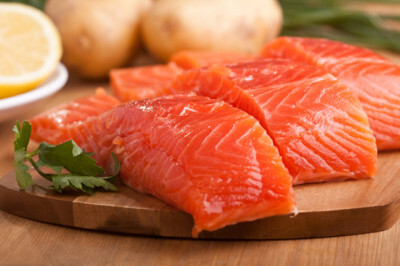 Omega-3 fatty acids can be found in Salmon. Salmon has earned its research reputation as a health-supportive food based largely on its unusual omega-3 fatty acid content. Omega-3s support a healthy skin inflammatory response which is greatly a positive aspect for clearer skin. These is just one reason, among many, why we at bestanti-aging love Omega-3 and the wonderful benefits it has on our skin. Fatty acids can act as natural moisturizers that revitalize dry skin from the inside out. Salmon is also packed with vitamin B12. It contains the second-most vitamin B12 founded in any food, only sardines contain more vitamin B12. Vitamin B12 provides great benefit to the skin, helping to repair skin cells and keep your skin looking its best. Getting the right mix of B vitamins can help conditions ranging from dryness and redness to acne and other blemishes. It’s simply something you don’t want to run low on if you want your skin to be radiate and clear. Other benefits of salmon are; reduces depression (can prevent), reduces kidney diseases (not proven), reduces memory loss, Asthma (not proven), Good for the Nails, Makes Hair Healthier, Good for Brain Health (hard proof! ), Boosts Energy Levels.